A detective hunting for answers. A dangerous secret hiding in the desert. When an old friend from Little Tokyo asks for help locating his missing nephew, detective Charlie Madison takes the case. What begins as a search for a rebellious youth leads Madison out into the desert Wastes where he encounters a gang of marauders looking for an easy mark and secretive Federal agents tasked with detaining political activists. In the process, he uncovers an isolated facility and an off-the-books operation with the potential to destabilize the United World government. Determined to find the truth before Blackshirts eliminate every shred of evidence, Madison must fight to stay alive, facing trigger-happy robots and a genetic monstrosity intent on putting him out of commission. Nothing is as it seems, and time’s running out. Charlie Madison has encountered more than his share of unusual suspects in the past. This time he’s up against something the likes of which he’s never seen – on or off the battlefield. Can he solve a case with so many missing pieces? 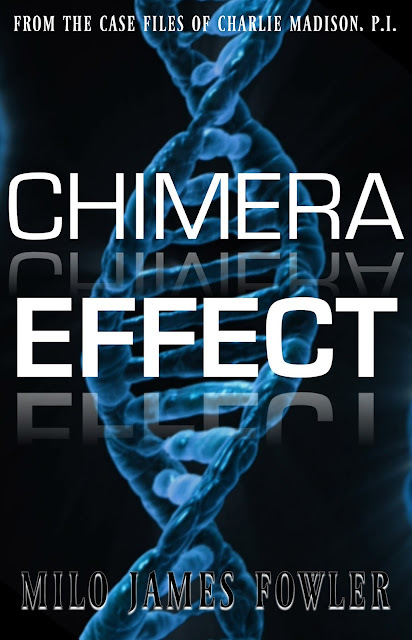 Chimera Effect is the follow-up to Yakuza Territory, continuing The Suprahuman Secret series I started with Girl of Great Price and Immaterial Evidence. Unlike Death Duel, a stand-alone case file, Chimera Effect takes readers on a journey that will culminate in the final series installment, The Gifted Ones (available next year). I had fun with this tale, expanding Madison's world beyond the city and Little Tokyo to include the Wastes, a post-apocalyptic desert ravaged by war. And I was able to introduce a character that will have a major role to play in The Gifted Ones, a certain Dr. X. She's just as mysterious as she sounds.